The IBM® System Storage® Solutions Handbook helps you solve your current and future data storage business requirements. It helps you achieve enhanced storage efficiency by design to allow managed cost, capacity of growth, greater mobility, and stronger control over storage performance and management. It describes the most current IBM storage products, including the IBM Spectrum™ family, IBM FlashSystem®, disk, and tape, as well as virtualized solutions such IBM Storage Cloud. 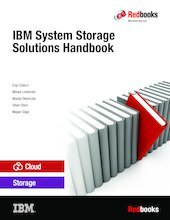 This IBM Redbooks® publication provides overviews and information about the most current IBM System Storage products. It shows how IBM delivers the right mix of products for nearly every aspect of business continuance and business efficiency. IBM storage products can help you store, safeguard, retrieve, and share your data. This book is intended as a reference for basic and comprehensive information about the IBM Storage products portfolio. It provides a starting point for establishing your own enterprise storage environment. This book describes the IBM Storage products as of March, 2016.